There is a lot of talk about discipleship these days — and it is about time. Jesus seemed to think discipleship was a big deal, putting it as the heart — and the verb — of the Great Commission to "make disciples of all nations." Yet, it seems discipleship has fallen on hard times in many churches in the West — for example, English-speaking places like the U.S., Canada, Australia, and England where there are Christians who are just not as desperate and committed as their sisters and brothers in the Two-Thirds World. I would go so far as to say that our discipleship model is broken. I would like to suggest some areas where we are broken and hopefully provide some solutions about how to fix them. 1. We equate discipleship with religious knowledge. While I don't think one can appropriately grow without seeking more biblical knowledge, many times believers reduce the discipleship process to, "Read this. Study this. Memorize this. Good to go." This is unfortunate. "The point is not information, but Christ-like transformation." Instead, discipleship is to be more like Jesus. Christ-like transformation is the goal, as we are "to be conformed to the image of His Son, so that He would be the firstborn among many brothers" (Romans 8:29). The point is not information, but Christ-like transformation. And, that means it is not about knowledge in general, but about knowing Jesus better. Trying to be like Jesus, without the power of Jesus, dishonors Jesus. 2. We try to program discipleship. 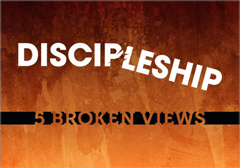 Discipleship is not a six-week course. It requires both the pursuit of knowledge and intentional action. Too many offer a book or a class when what is needed is a life. Instead, when Jesus made disciples, He brought them along as He ministered to people. I'm currently discipling a new believer, and we're actually doing ministry together — instead of me just telling him about it. The good news is that the research tells us people want this. In fact, in a recent LifeWay Research study, we found that a large majority of those who have previously attended a small group of some kind, but who are not attending now, would consider attending a new group, but they want to meet with their group more often than just once a week for bible study. People are looking for meaningful, shared-life relationships, not just a discipleship class. 3. We equate discipleship with our preaching. I'm just going to say it: Pastors, move beyond your arrogance and stop thinking your preaching is enough to be the church's discipleship strategy. This is not just my opinion. Recent research done by LifeWay Research indicates that 56% of pastors surveyed believe that their weekly sermon, or another one of their teaching times such as Sunday evenings/Wednesday evenings, was the most important discipling ministry in the church. While it is great to see the recent renaissance of Bible-based preaching, along with it we have to jettison the idea that "If people just listen to my sermons, they will grow spiritually." "Discipleship is not a Sunday event, it is a daily commitment." Instead, discipleship is a daily process. Pastors, we have to develop more robust discipleship plans than just our weekly messages. Discipleship is not a Sunday event, it is a daily commitment. 4. We think that we will grow without effort. For many, they think that God saved them and now they should just go to church and maybe stay away from the really big sins. They are unintentional in tending to their spiritual growth. Sadly we have not done much to change this. Instead, we need to understand that the scripture teaches that each person is to not be a passive spectator, but rather to "work out your own salvation" (Phil. 2:12). Discipleship takes every believer's intentional effort. Yes, effort. Believers must take steps to grow, and that is in line with grace. Notice that this passage does not say "work on your own salvation" or "work toward" it. You cannot. It is by grace and through faith. However, as a believer, you do take effort to grow—but that does not earn you a relationship with God, it just puts you in the right place where God can grow you as a believer, saved by grace. As Dallas Willard has explained, "Grace is not opposed to effort, it is opposed to earning." 5. We don't offer practical steps. Changing a church's consumer culture requires an intentional discipleship plan and strategy. We are often intentional about our preaching schedule; why, then, are we not intentional about a discipleship strategy? Assuming your discipleship plan is biblically grounded, the specifics of your plan are not nearly as important as implementing one and communicating it well. Heralding a strategy as the way to become a disciple would be arrogant, but each church should explain its discipleship strategy as "our church's way of discipleship." Identifying the challenges of genuine discipleship and committing to a process that works through them are the first and necessary steps to cultivating a church filled with on-mission disciples. Ed Stetzer is President of LifeWay Research and LifeWay’s Missiologist in Residence.